Do you ever do something out of necessity that you had been putting off, and then wonder why it took you so long to do that in the first place? It turned out so much better and the thought of you waiting to do it confuses you now? 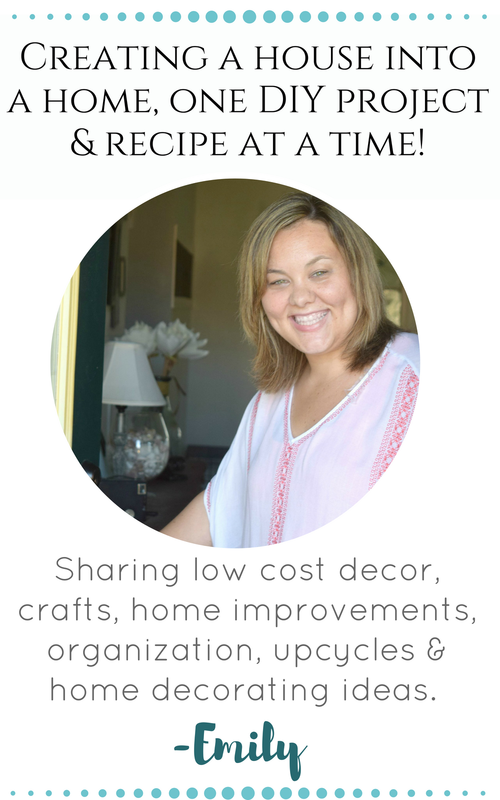 Of course I am talking about something having to do with home decor, but really there are so many instances in life where waiting to do something turns into something you should have done a long time ago. Such as having a baby, going to college, buying a house, paying off debt, growing out your bangs, and so on. Well, today’s post is one of those things I put off doing and then once done I am so happy with the results, I wonder why it took me so long to do it? 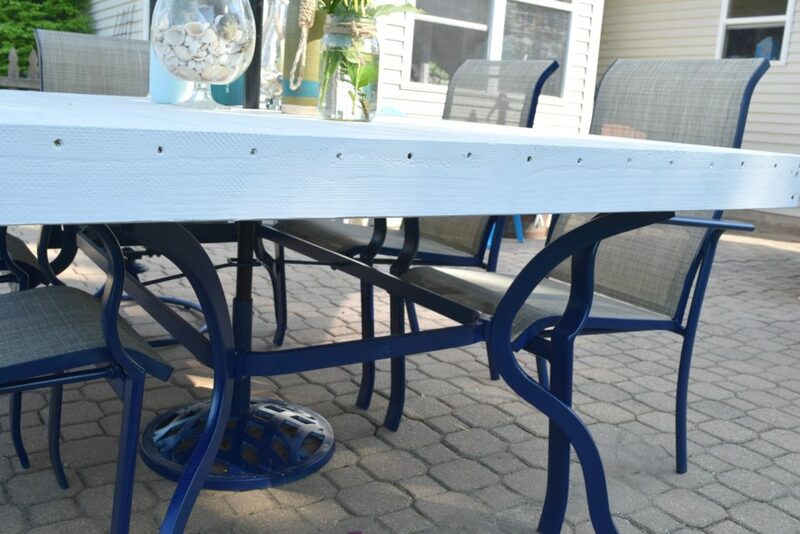 Today it is all about the Patio table transformation with full tutorial, and since we are in full-on summer mode around here I felt this DIY project was in great company for all of those summer meals being eaten outside. See, we had this patio table that was given to us by my in-laws years ago. 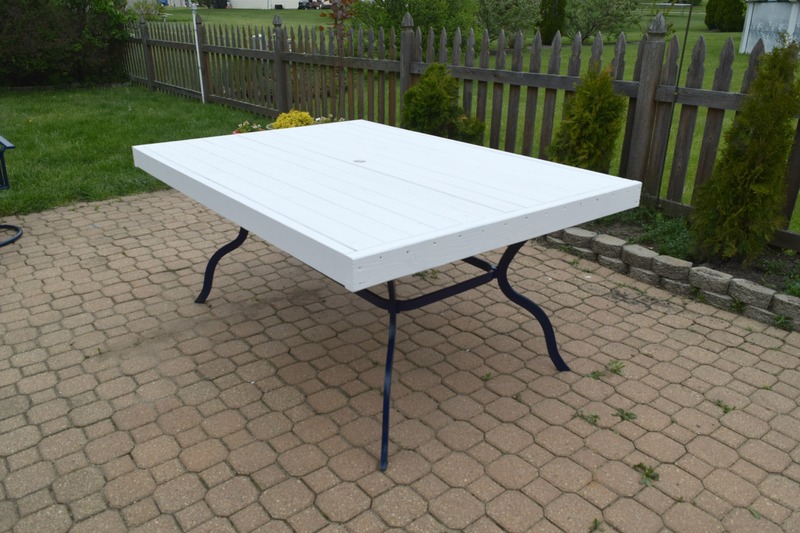 Dale and I had dreams of a beautiful and rustic outdoor table, with all of the charm to make any Fixer Upper fangirls be all kinds of happy. 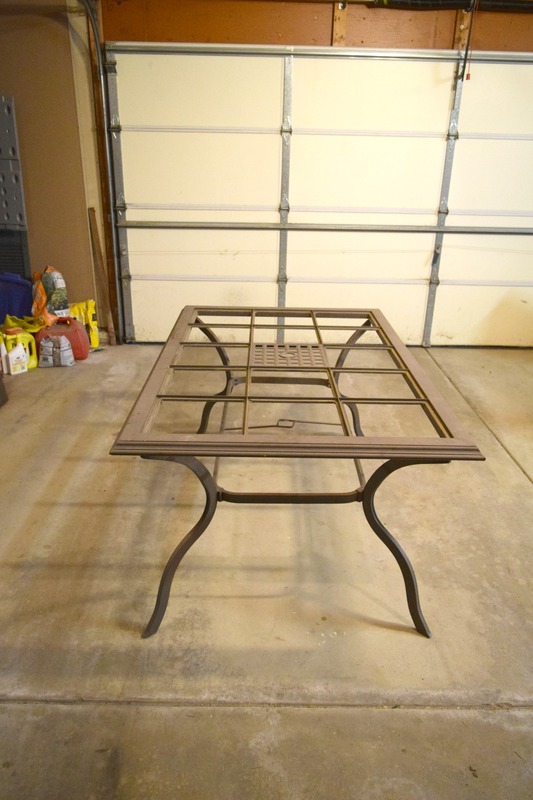 But, making a table takes time, and contrary to what it may appear on this blog… we do not spend every waking hour DIYing home projects. So this one has worked, never been fully “us” but it did the job of helping us enjoy the outdoor space. The above picture was taken last summer, since this was taken three of the tiles got broken. Two years previously we replaced another two that got broken. When three more broke, it was a sign for us to buck up and either purchase or make a new table. Which I was taking my time figuring out, searching for, and day dreaming of. Our outdoor space was a work in progress and this was just another portion of it caught in the shuffle. 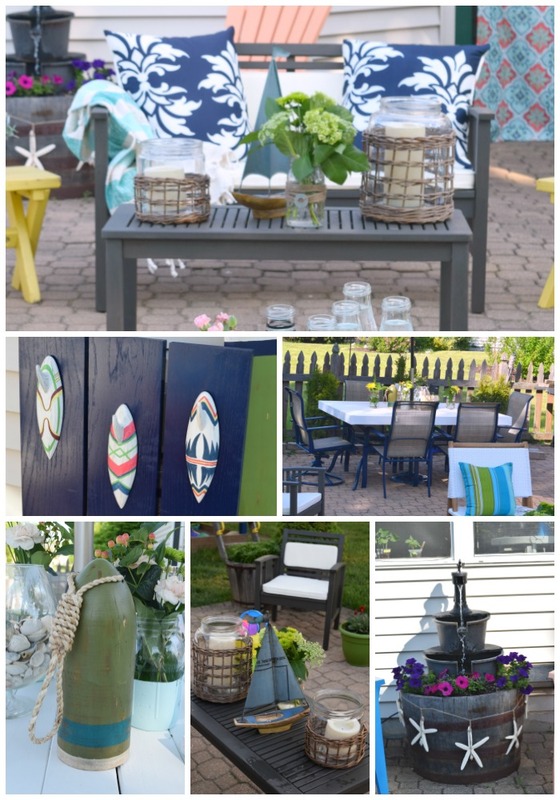 And then I had an amazing collaboration come up with World Market to revamp my outdoor space. 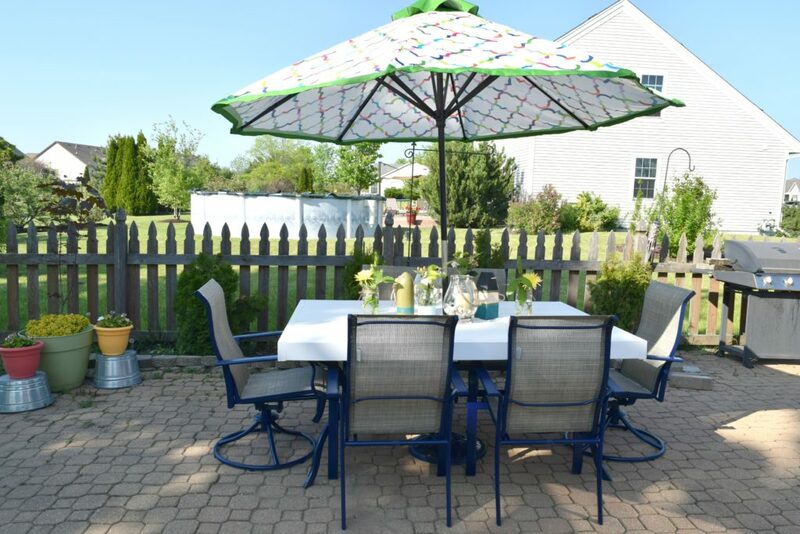 Which would include this eating area of our backyard patio. Once I stopped jumping with excitement I got down to business making plans to transform my patio area. The results are everything this California girl stuck in the Midwest could dream up! Let’s go back though, I had a big timeline I had to hit with the campaign, and a budget to stick to. 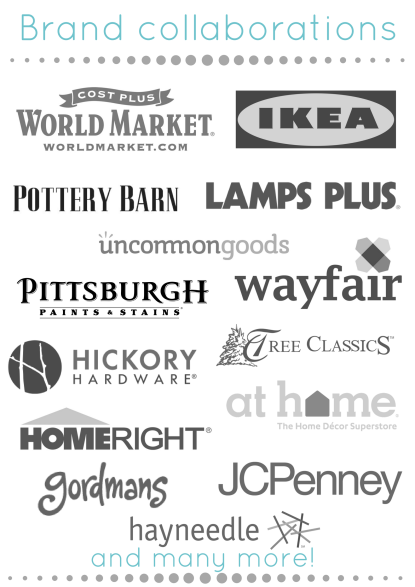 So making or even purchasing a new table was out. 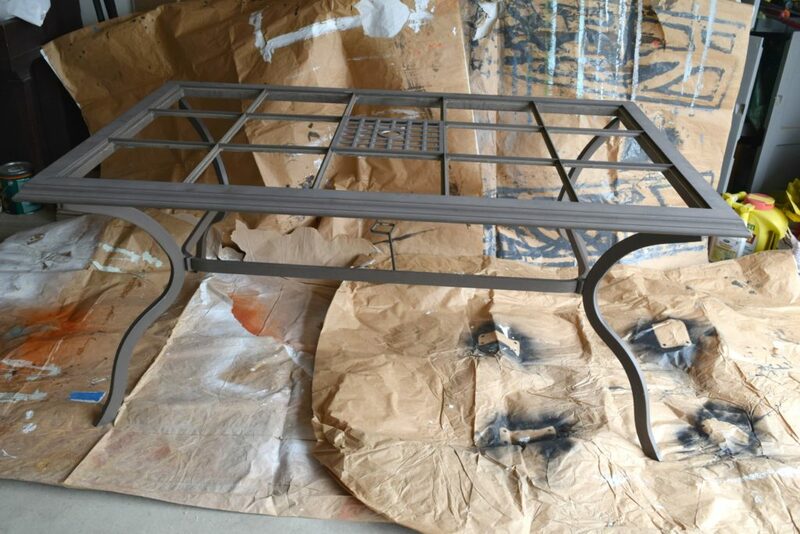 Then I planned to simply spray paint the legs, when in doubt paint it. That must be a DIYers quote or something. But visions of my rustic table were still happening for me. Then, it all came together! So weird how things just work themselves out as I am thinking about them. It feels like a true “lightbulb” situation. I would use the table but turn it rustic. Dale was pleased it was less work, time and money. 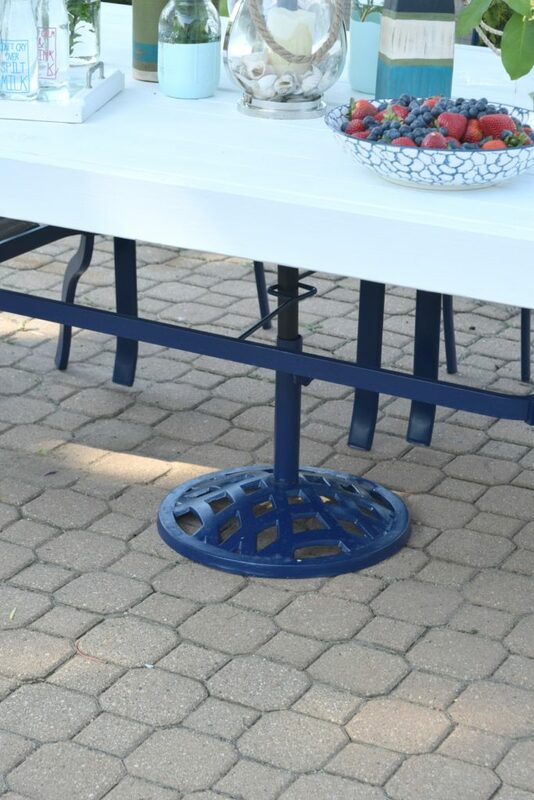 I was happy I would get a rustic patio table with a pop of color, all in perfect time for my new deadline! First things first, get rid of those tiles. I cannot believe I do not have a picture of it with three tiles broken, but they were broken and this was one sad looking patio table. I set up my super professional spray painting station. only the best around here. 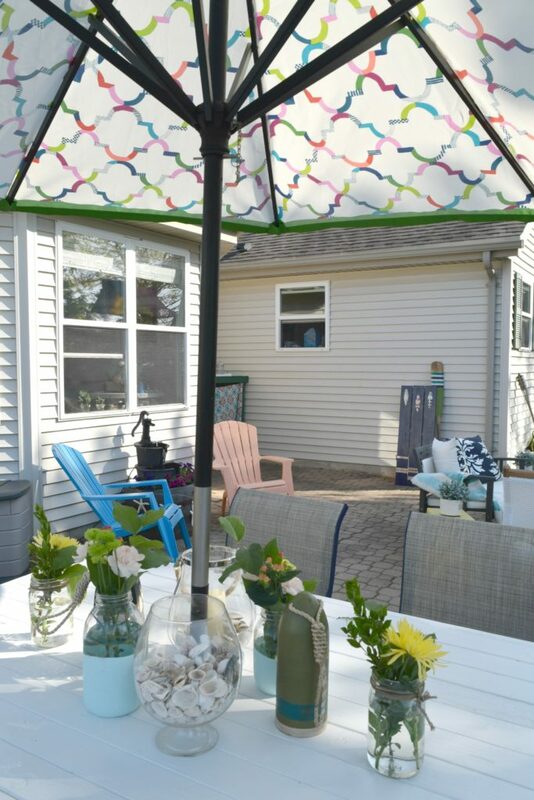 I wanted to add some major pops of color to my patio area. I knew I had white and gray furniture so finding other ways to bring in some great color was a must. 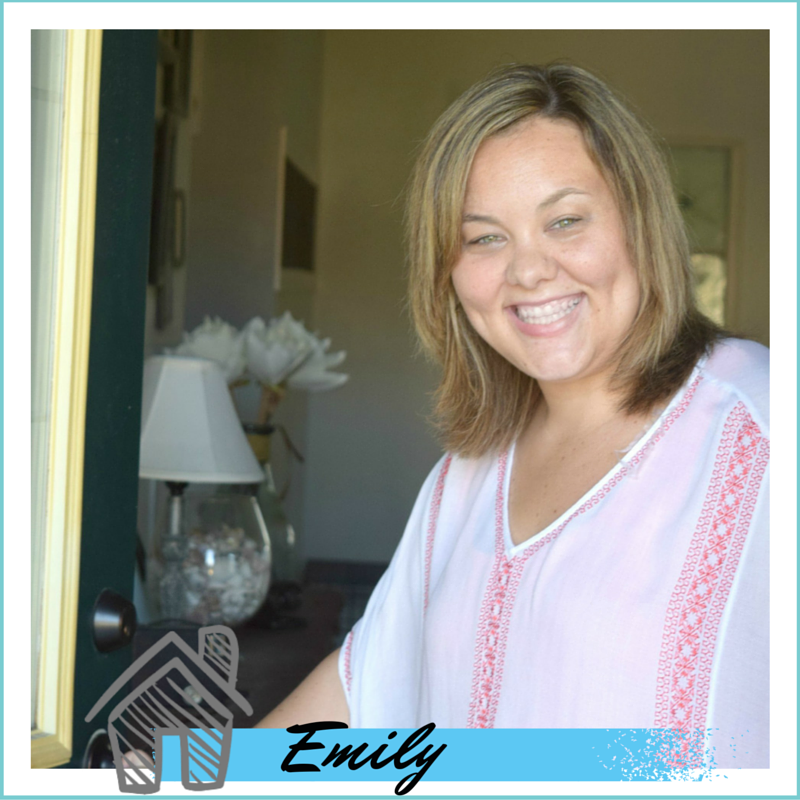 I decorate with color inside my home, the outside you can go even a little more bold. 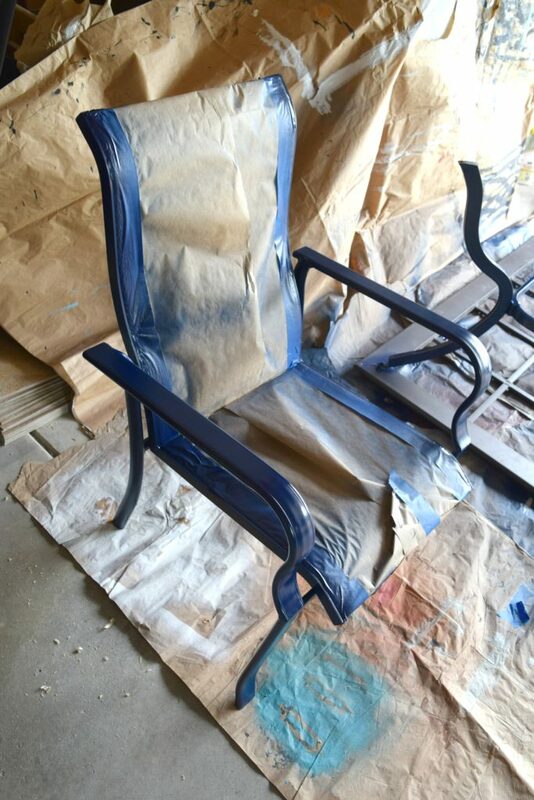 I used a glossy blue color and spray painted the legs. I did not need to paint the top because it will be covered. Because I take the “reduce, reuse, and recycle” phrase to heart I am also reusing the umbrella stand. I believe this was originally a green color. Can we say sun damage?! Before I spray painted this I took Dale’s toothbrush and scrubbed any rusted pieces off of this. Kidding! I just wanted to see if you were still reading or just scrolling through the pictures 😉 I did however scrape off any rust or loose pieces from this since it is so weathered. Using the same bold blue color to spray paint the umbrella stand. 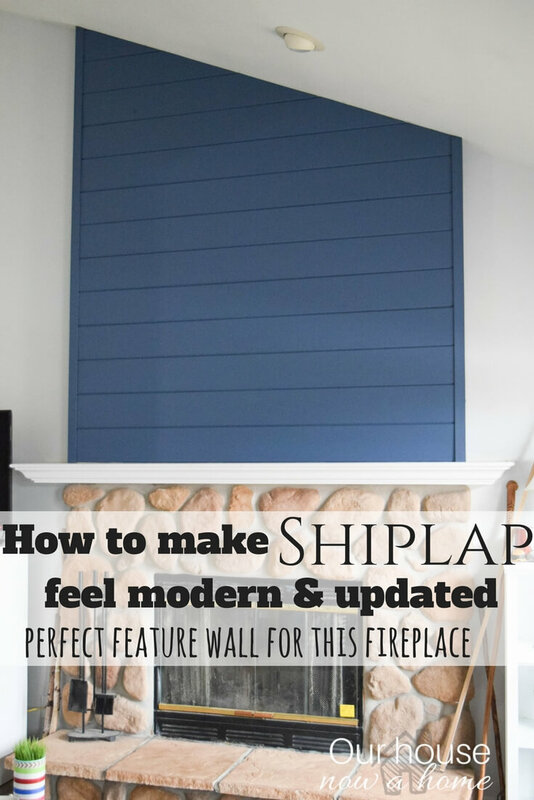 Now for the Joanna Gaines and Fixer Upper special, adding some shiplap! Well, this is not officially shiplap, more along the lines of standard 2×4’s. But the rustic feel is still there I promise! I measured the original table and lined up the 2×4’s to match that. 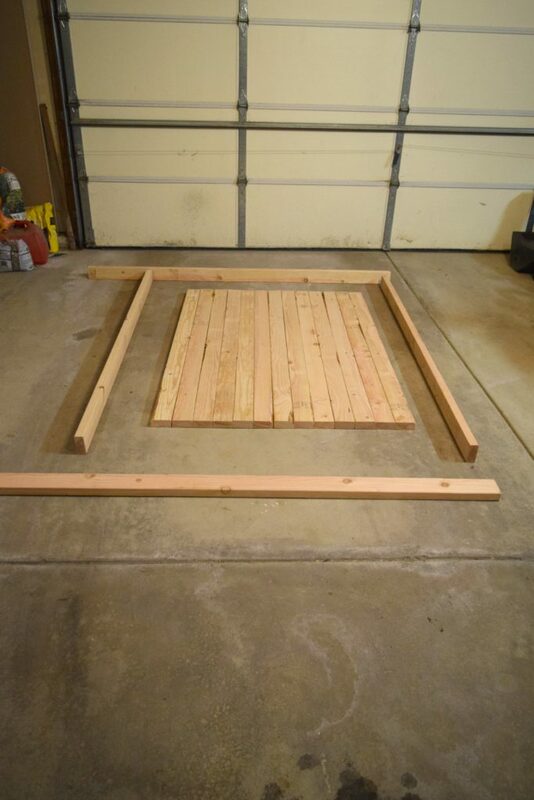 I then added one extra 2×4 to give an overhang to the wood top. As you can see from the above picture. The next plan is to add a trim to the table, I felt this was needed to have a finished look to this already rough looking table. This is intentional roughness though, as opposed to the original look to the table which was rough in the saddest sense. I added the trim with more 2×4’s, which are officially my favorite wood to have around the house. They always come in handy. 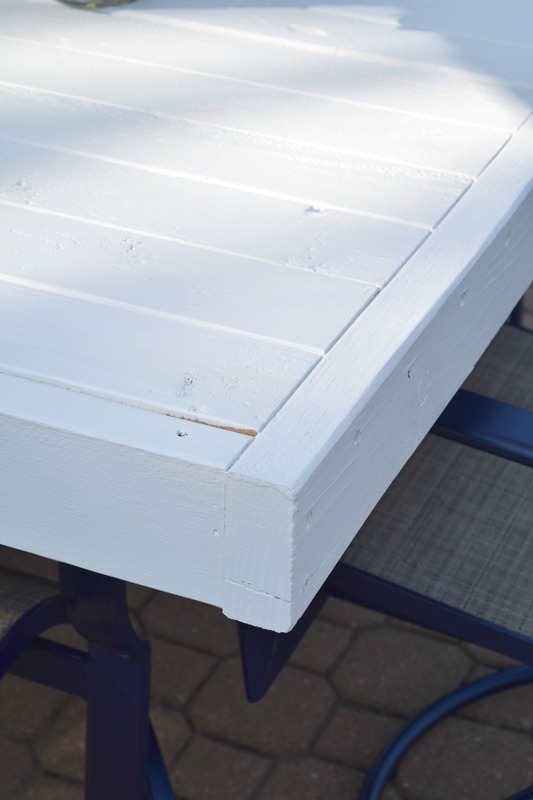 Set the trim or border pieces around the table top wood, measure, mark and cut. 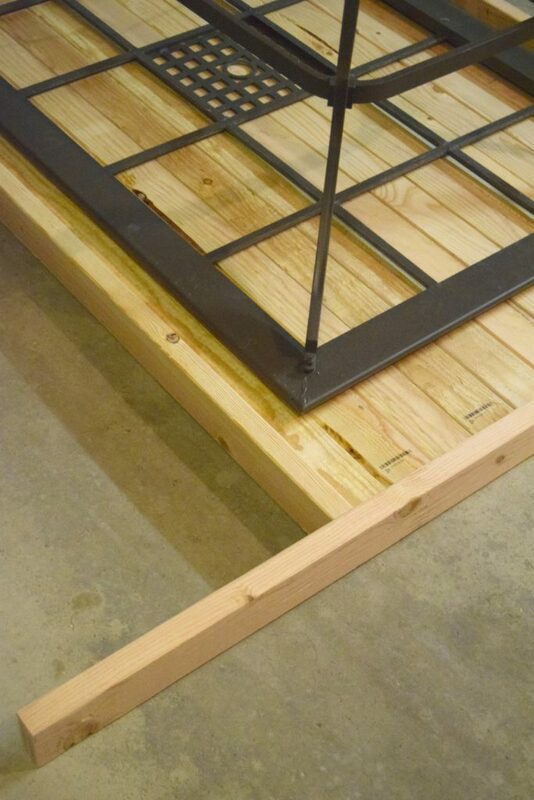 Once all was cut, I confirmed the table would fit on it perfectly by setting the table upside down on top of this. Once I knew it was all sized right, I nailed it all together. Because we do not have a covered patio this table has to work with an umbrella. So I centered the table bottom onto the new wood top. Marked where the original umbrella hole was on the table. Used that same sized drill bit and drilled the new hole. I have my own little sweat shop here, forcing some extra helpers. 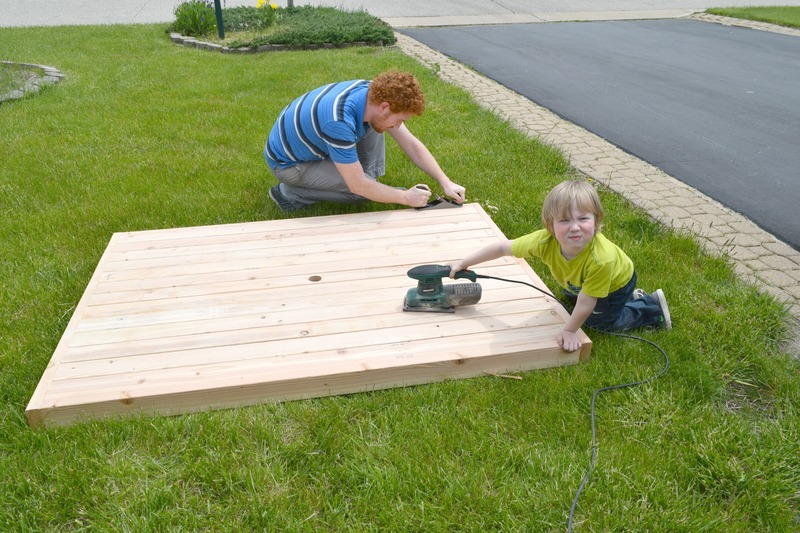 Actually Dale and I work together a lot on projects and at least one of the kids want to get in on the action. On this day Gavin who is my youngest wanted to help out. Look at his face? He means business with that sanding. 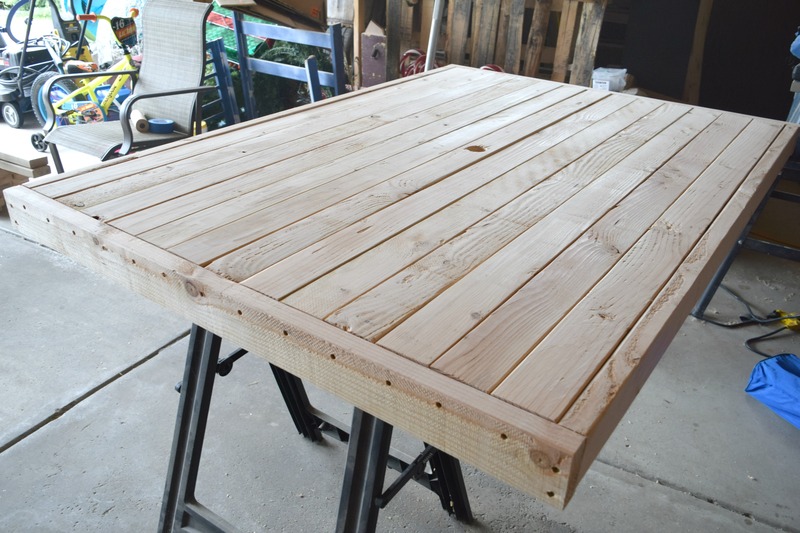 Sanding down the table is needed, because even though I did everything perfect in building this, as I do everything in life…. 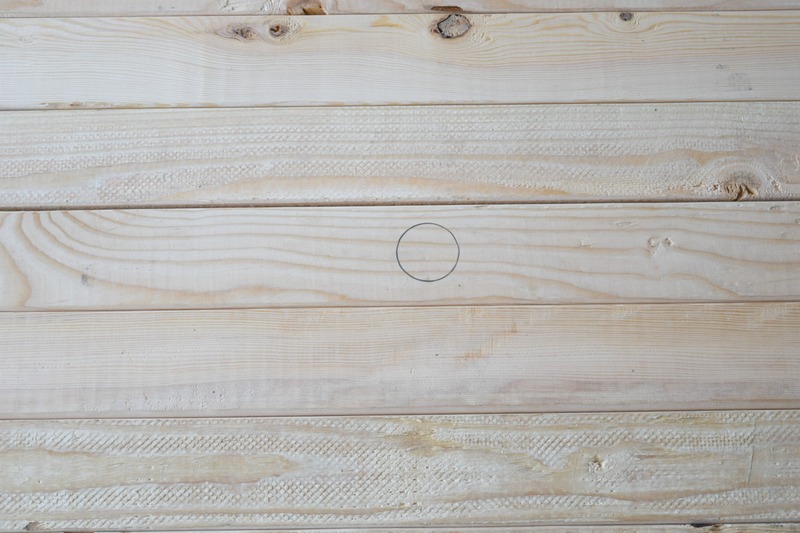 the wood will still have spots that either pop up or down, making the table surface uneven in places. 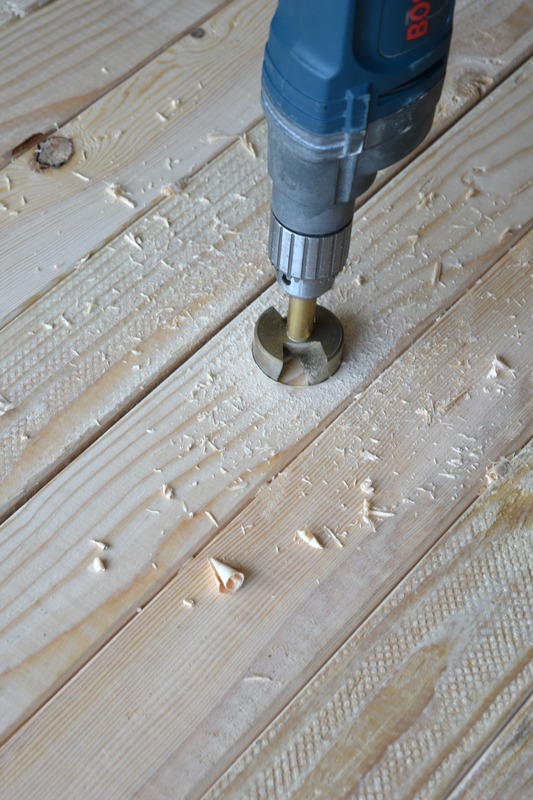 Dale is using a hand planer to soften any of those uneven spots. Gavin (the sander is not actually on) is demonstrating what the sander does. Getting the wood ready to take the paint. I can just see him being a legit help with home improvement projects in a few years. 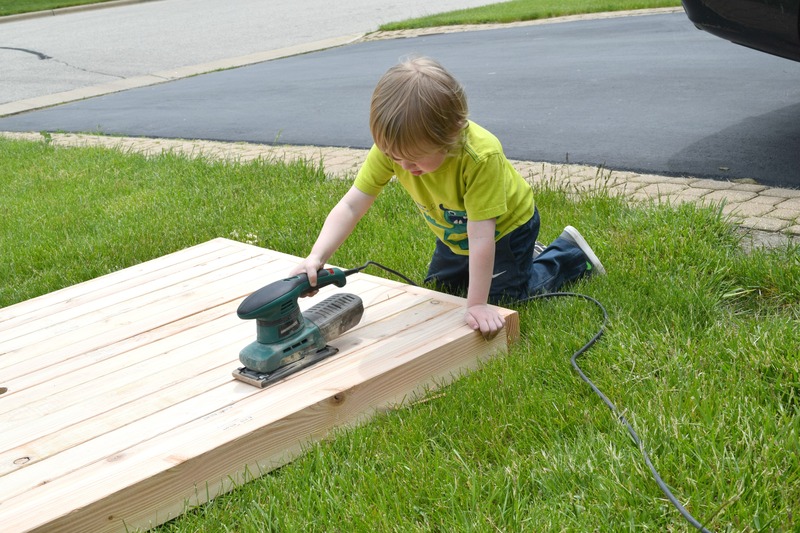 His eagerness to get in the thick of things is wonderful and he has grown up around DIY projects. While the menfolk were using their muscles I was getting ready to pretty-up the chairs. 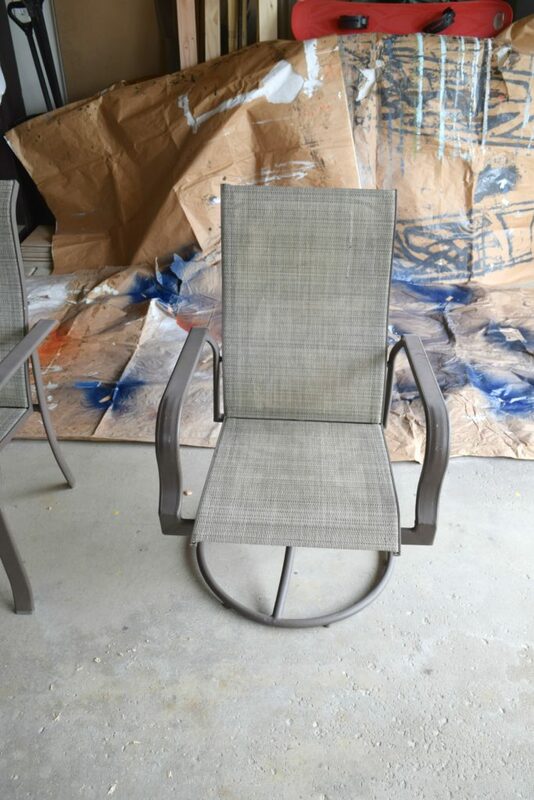 I went back and forth on this a bunch, how was it best to paint these chairs? 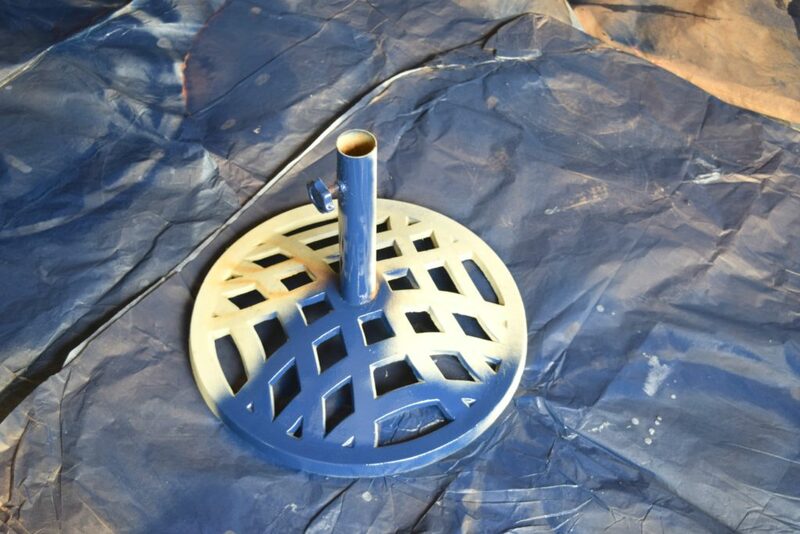 I knew I wanted them blue like the table legs, but worried spray painting the actual seat itself would not work. 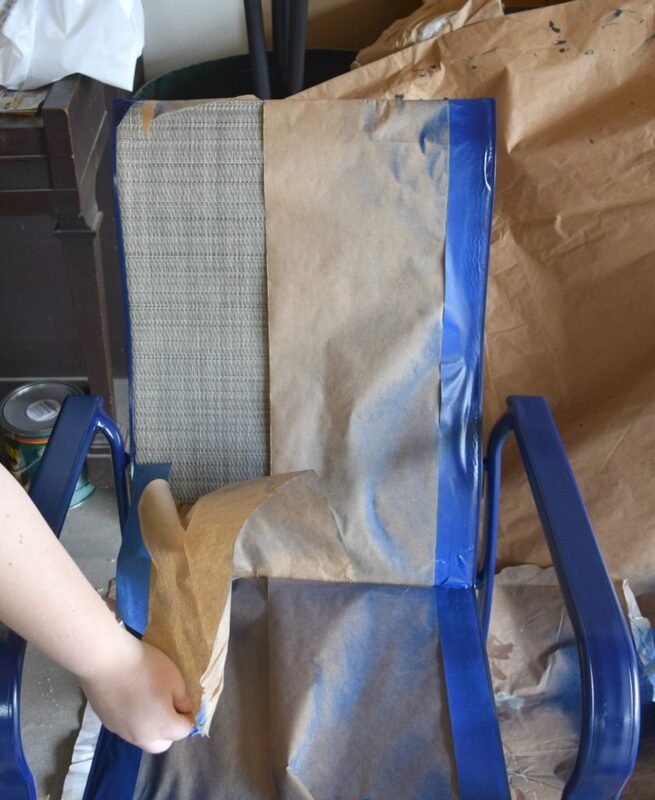 The seat is a mesh like material and I did not think I would get an even paint job. I decided the best way to improve these would be to paint everything but the seat and backrest. 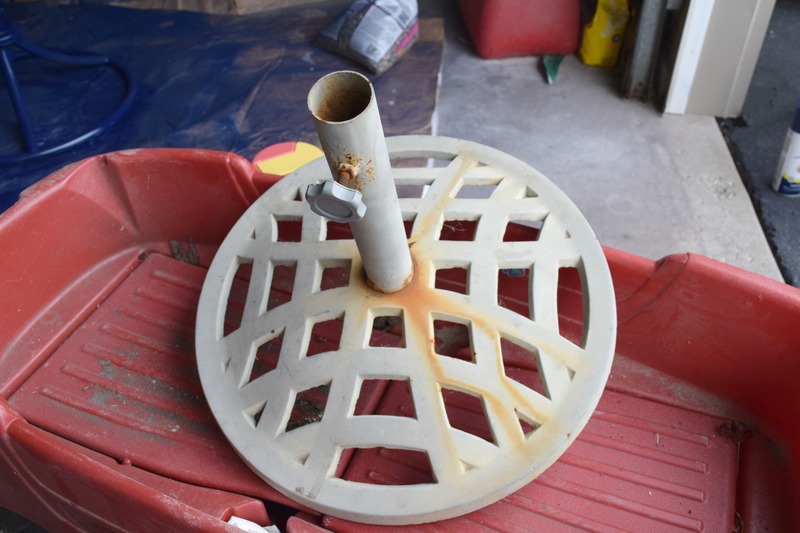 No big deal, except… you know… the problem of not getting any paint on that part, at all! My solution was cover and tape the s**t out of it. I was sure to tape up any crease, any break in the paper or what looked like an opening for the spray paint. In order for this to work right the seat and back need to have no paint on it. No pressure! I spray painted as usual with even back and forth lines. Keeping the spray paint about 6-8 inches away from the chair. I did two coats of the paint. I will note that this is outdoor paint, so it should hold up to outdoor extremes. I held my breath as I peeled back the tape. I was imagining the chair seat and back to have a splatter of dark blue in random spots and I would have no clue where to go from here. Buy new chairs? Paint them blue? I was freaking out. 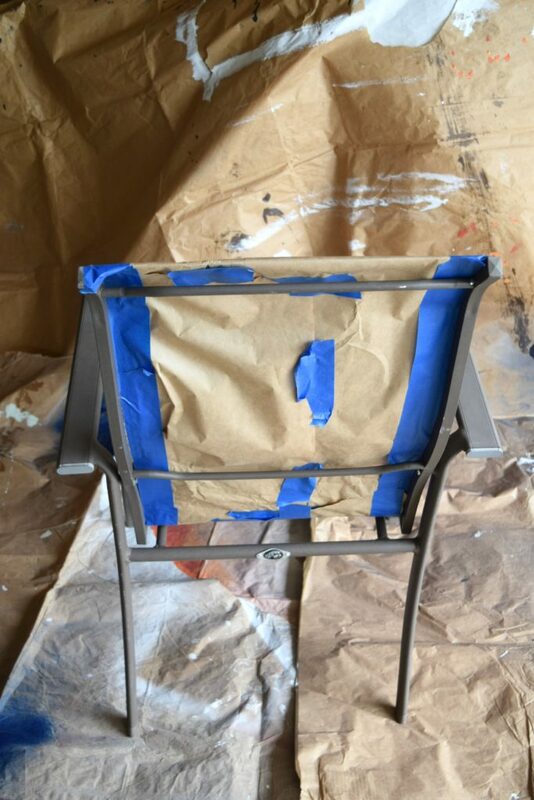 And was soooooo surprised when I peeled back the tape and paper to see a perfectly un-painted chair! 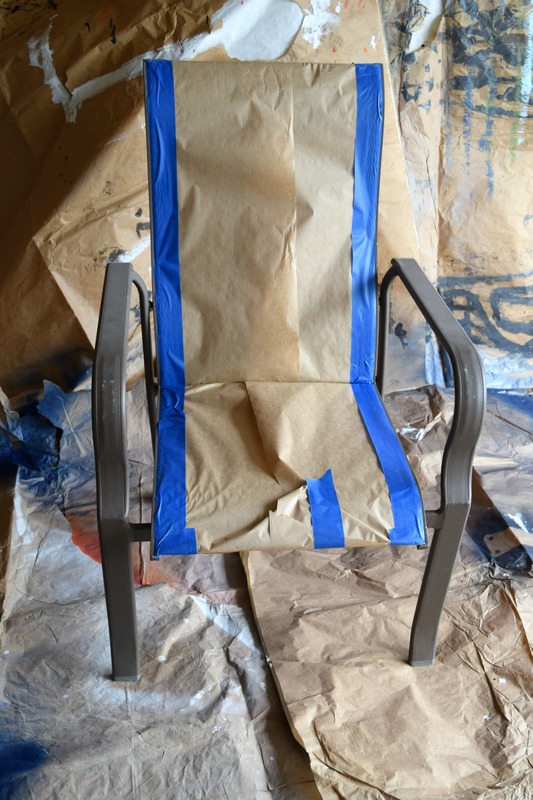 I will show you the full details of the chair for the big finale. 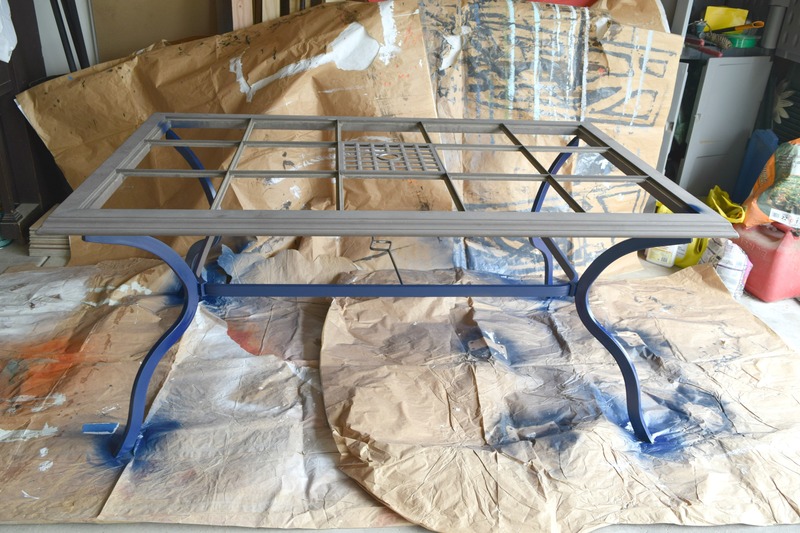 For now it is time for the table to get finished. 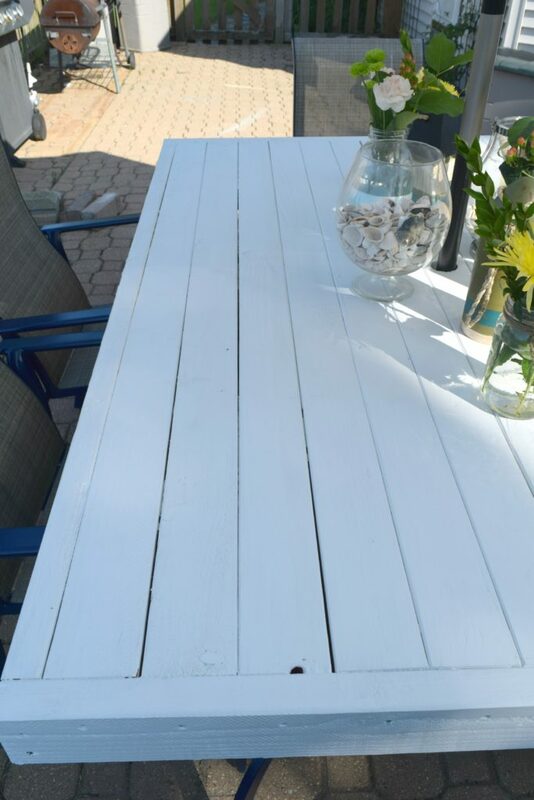 I used an outdoor white wood stain. 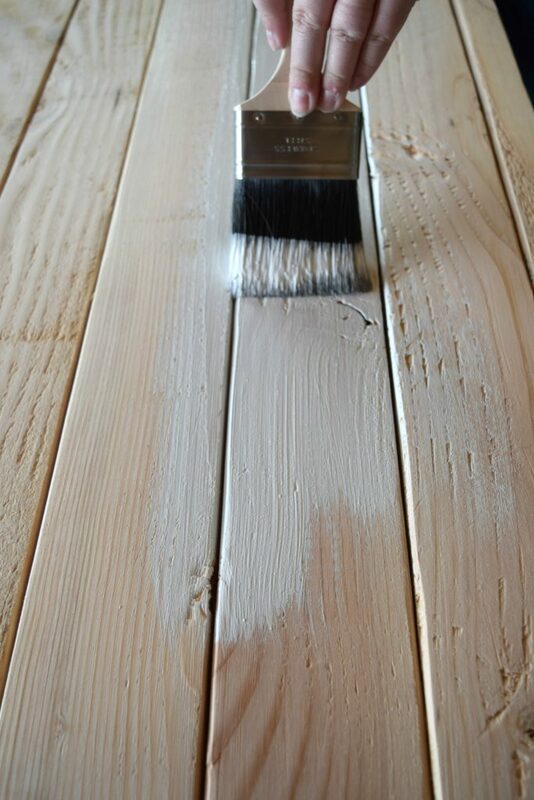 This was a new product that was recommended to us from the paint people at our home improvement store, they know us and we strike up conversations because we are there every weekend, sometimes more than once a day. They said it would last longer than us using just paint. I am all for things lasting longer. The stain goes on like paint, it is just thinner. I had to do three solid coats of the stain to get it with good coverage. Once all was dry and ready to go it is time to put it all together! I am such an impatient person and once a project is done I want it all put together now! 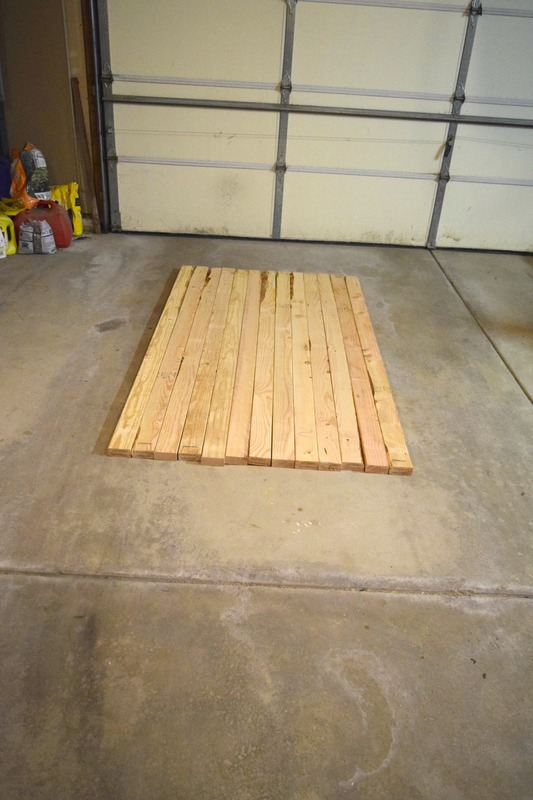 I used heavy wood for the table top, which is great because we get strong gusts of wind around here. 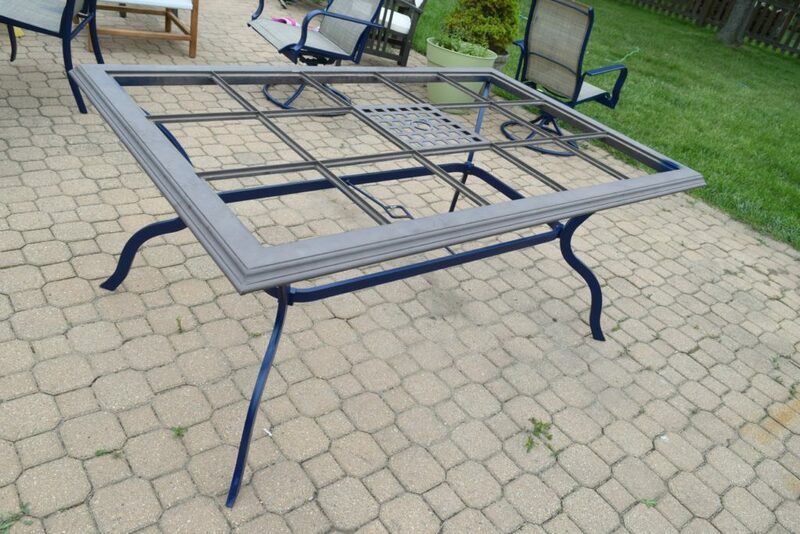 Which is why so many tiles were broken, the table before got blown over a lot. This one has almost no chance of blowing over. It is bad though because Dale and I did not have enough muscle to carry this from the garage into the backyard. 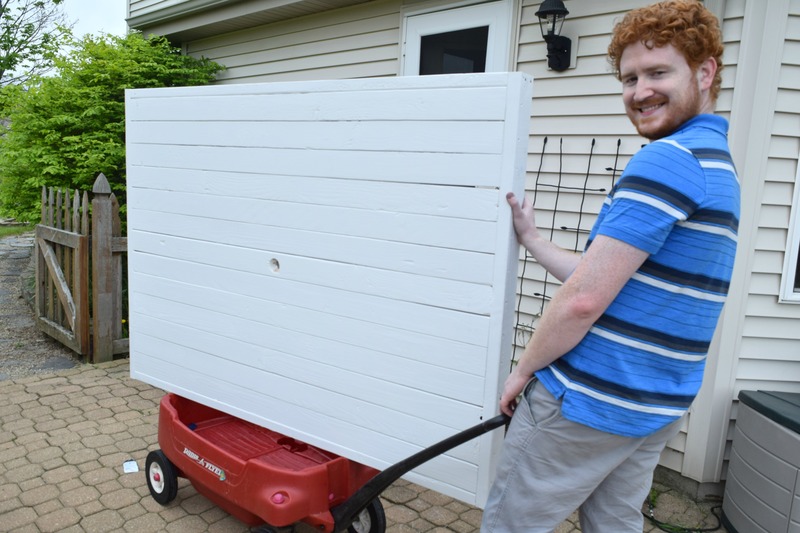 We used a wagon, me on the side holding it up and Dale pulling it. I would say our neighbors looked at us weird, but at this point they all know I have a home decor blog and see us do random stuff for the sake of home projects all the time. Also at this time we had two dogs running around outside, three kids… one with a cape on, one wearing rain boots and a swimsuit, and one ignoring everything while reading on the front porch. Us schlepping this around was the least of the side show status. 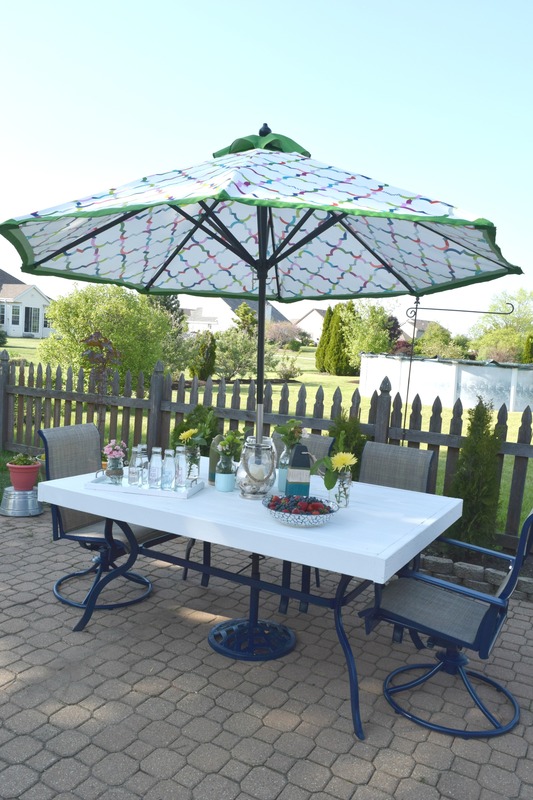 With my new umbrella from World Market and some well placed flowers this Patio table transformation with full tutorial is done! I have no clue how I got so lucky to have no paint bleed through my paper and tape idea. 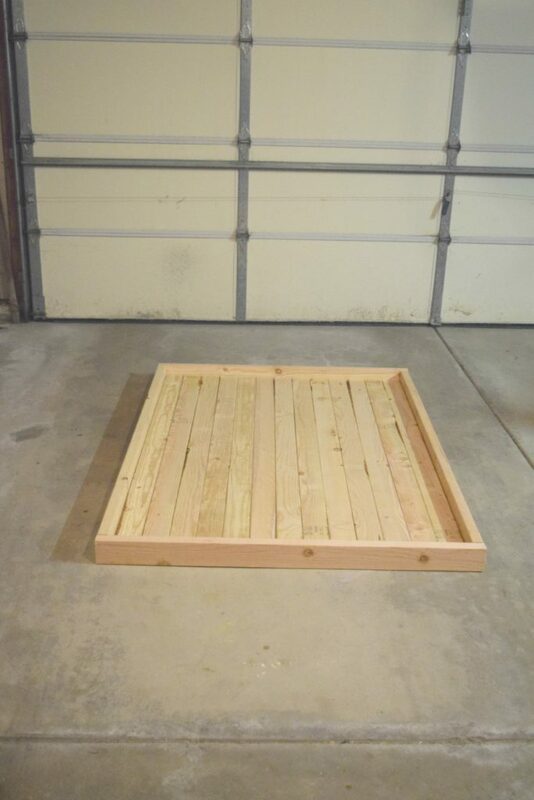 I almost never have a DIY project go this good without a fully planned idea beforehand. Weirdly enough I would have described the seat a brownish color before. 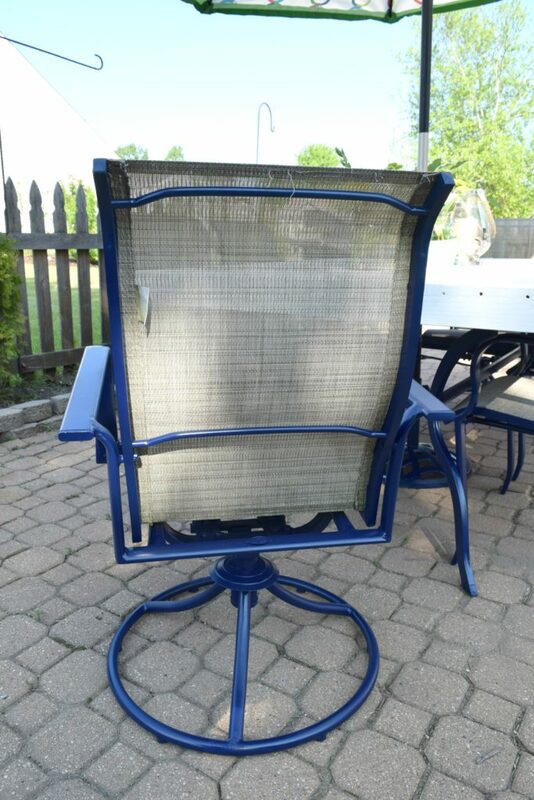 Now, with the dark blue and the white table top I see more gray in the seat. Which I am all for, I love the color gray and we are full on 50 shades of it around here. The actual color, not the book. Just wanted to clarify! 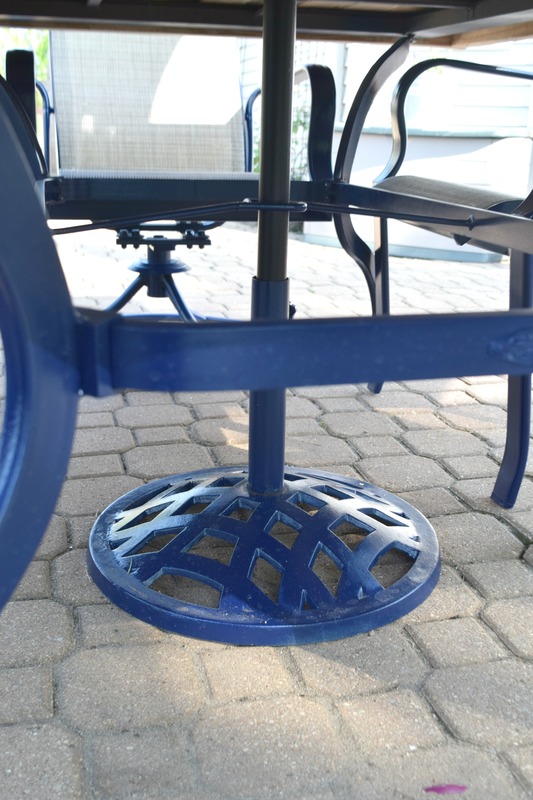 The reused umbrella stand looks perfectly shiny and new! 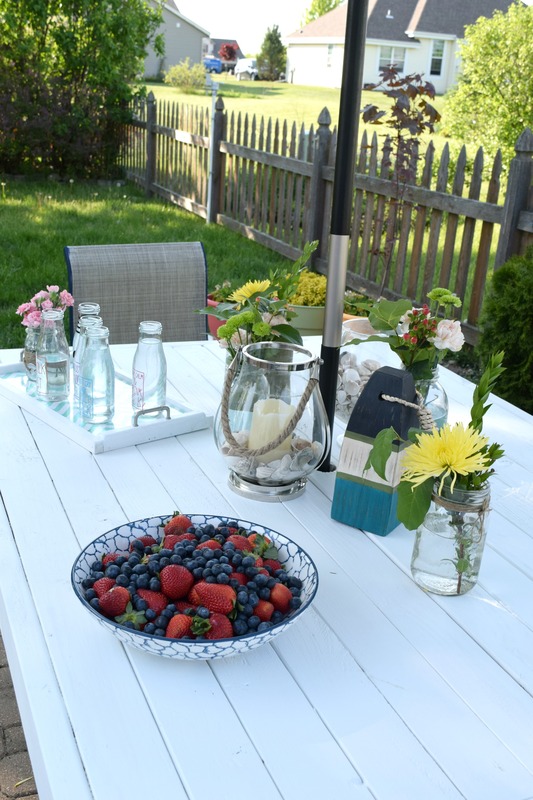 I love how this table mixes Dale’s love of all things rustic decor with my love of pops of color. If he had it his way we would live in a log cabin with log furniture. If I had it my way we would have a beach house with color, texture and pattern so busy it would make your head spin, tastefully of course. We eat dinner out here a few times a week in summer. The kids choose to have a lot of lunches out here, and if Dale and I have it together enough in the mornings we do have some weekend breakfasts here as well. The great thing about this whole table is that to clean it off I literally use the hose and spray it down! This is kid and mess proof! 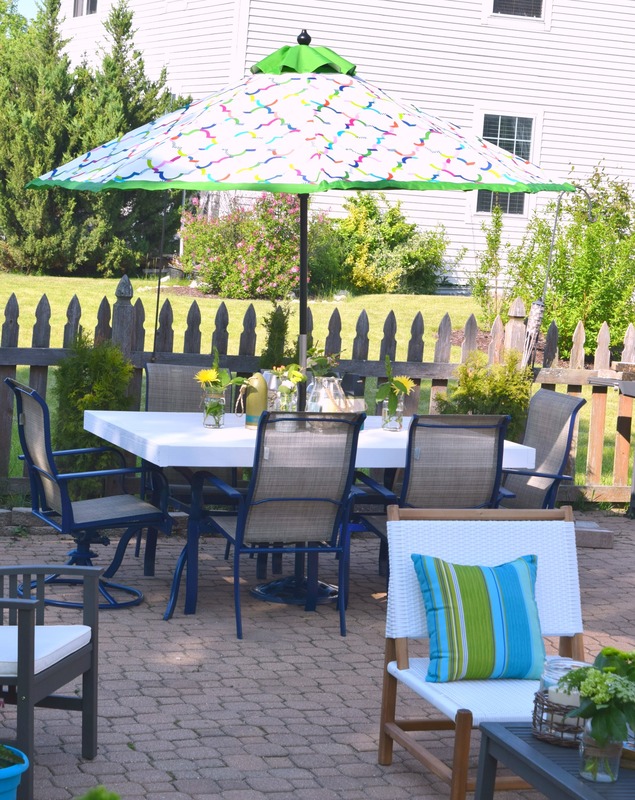 As you can tell from the bench I made in this picture, I love those pops of bright color! I kept the cuts simple and straight forward. 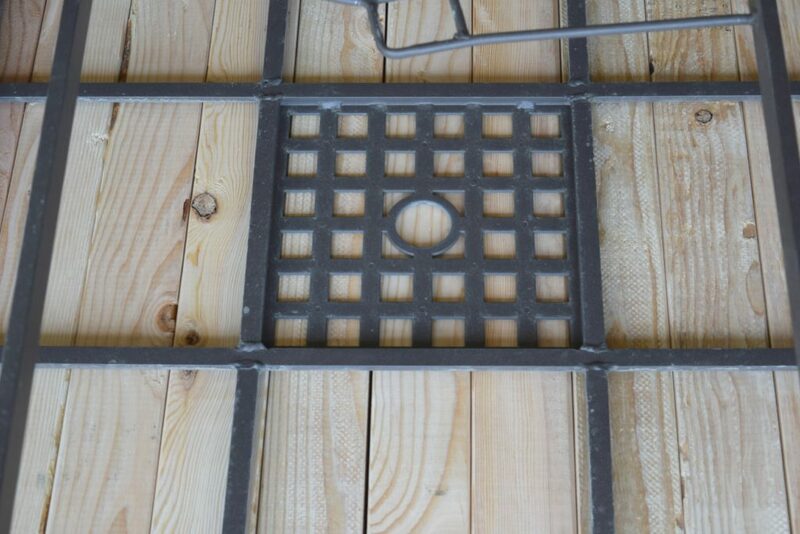 There was no 90 degree angle cuts, corners or routered edge. I wanted the full on rustic look, and also felt that with it being outdoors the little unpolished touches would work well here. 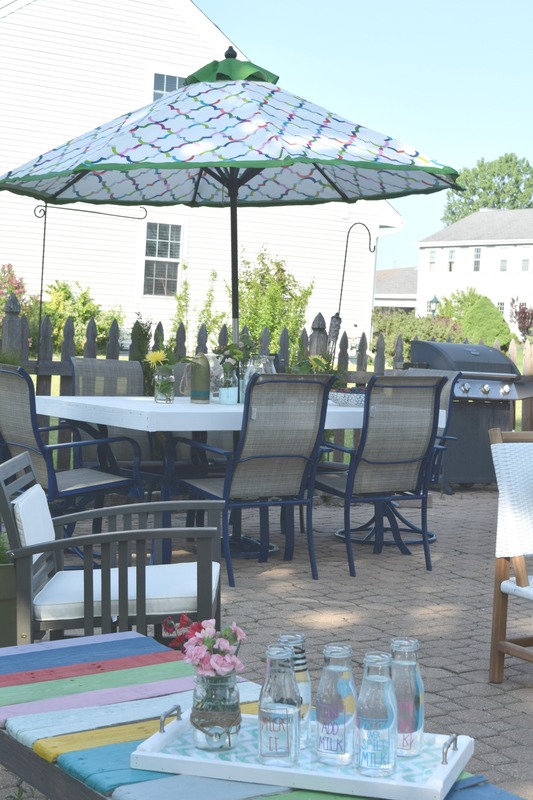 This whole patio area is a dream for me, and I love to spend time out here! 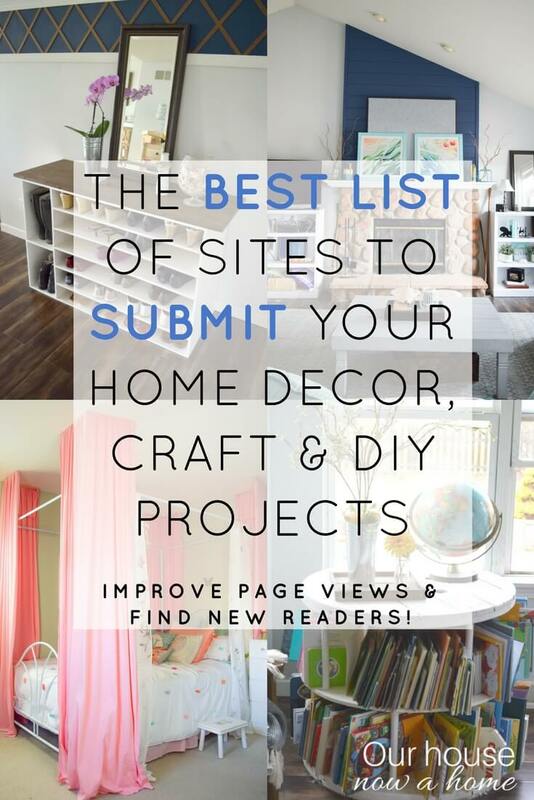 It is the best mix of new furniture, DIY new builds, upcycles, and thrift store finds. 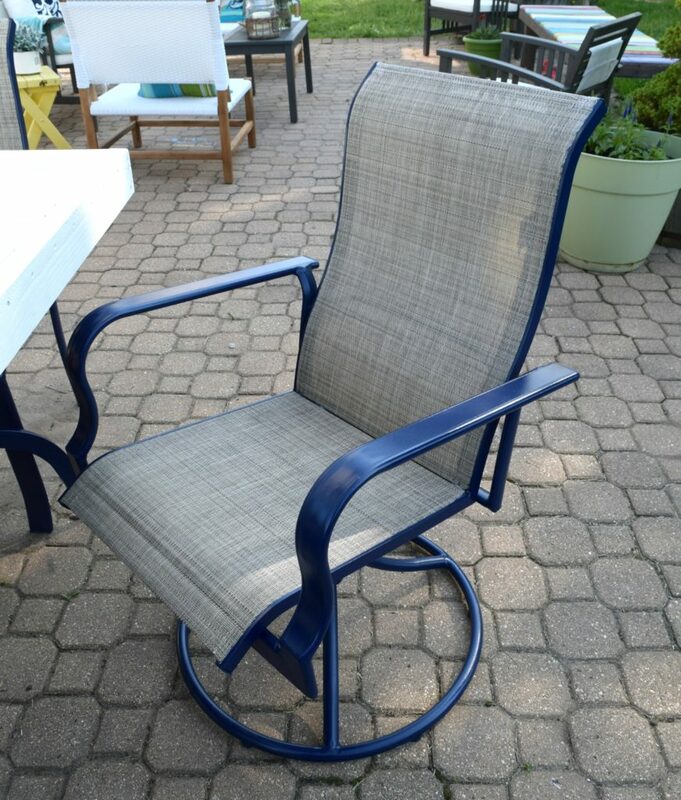 Do you see the gray undertones in this chair more too? I figured I would put my money where my mouth is, and show you the meal we actually put in our mouths on this table. This is our summer dining room. 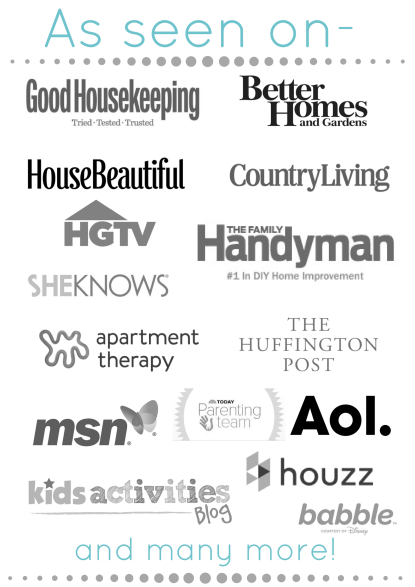 Whew, I feel like it has been forever since I did a major DIY project. 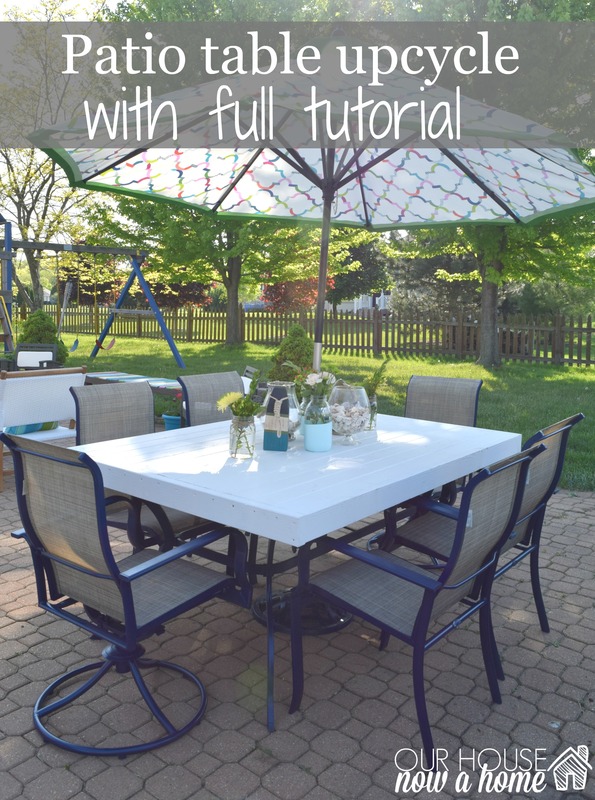 This Patio table transformation with full tutorial is still not major, but there was a lot of steps to explain. Also some much needed rambling because I get a bit wordy. Hopefully you all were ok with that. I also hope that you enjoyed the inspiration. 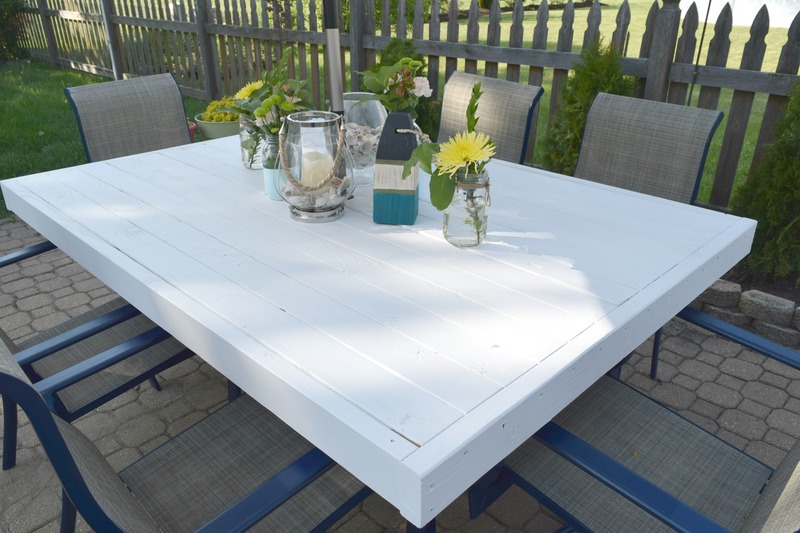 I know that the bulky and stunning farmhouse outdoor tables are really popular right now. But not everyone has the skills, time or money to make their own. Buying new is even more expensive. I know a lot of people have patio tables similar to this one, and I thought this option was a great one to share. We may replace it with something else eventually, we will need something bigger because as of now only one other person can sit at this table because we take up 5 seats already. But it works perfectly now for us. I told you this was a situation of wondering why it took me so long to do this in the first place? I love the results, and it was literally one day or work, including paint drying time. That is a quick project turn over for sure! Have you ever tackled a project and been so happy with the results? Wow it turned out great! I like the wood look a lot. Now that is awesome! 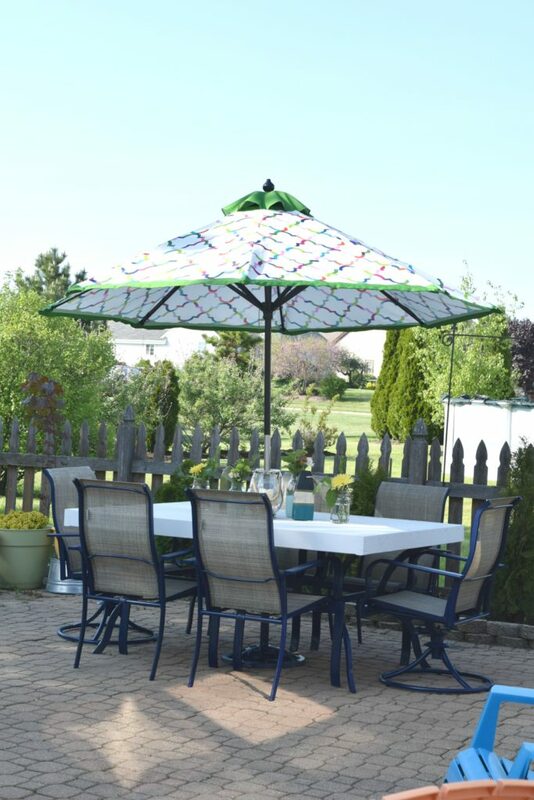 Our patio table definitely needs an update, and I might have to try this. Thank you! I am so happy you found this helpful! 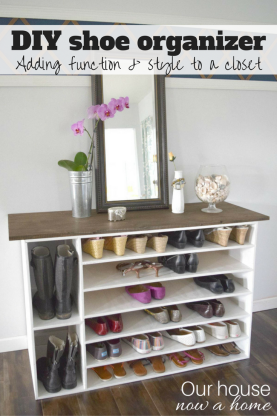 I love seeing upcycled projects! It gives me insipration for my own things that I want to work on. That turned out amazing! Thank you! I am so happy you enjoyed this idea. This looks amazing! 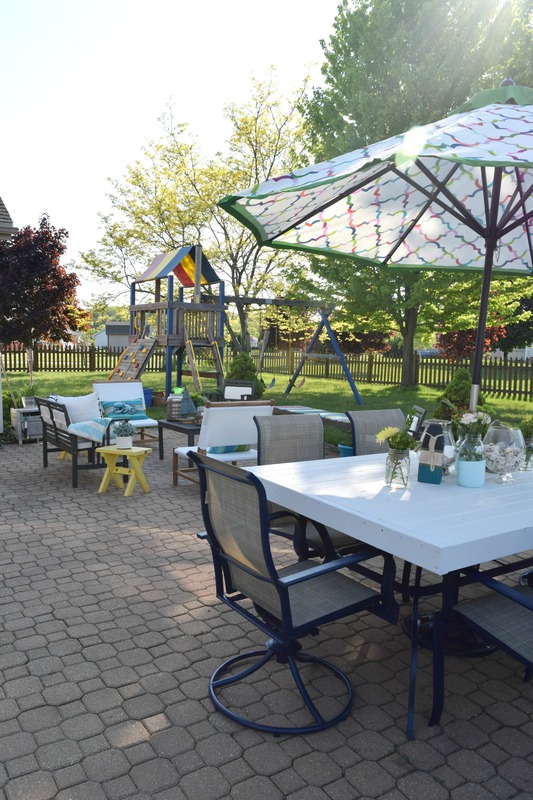 My dream yard for the kids. 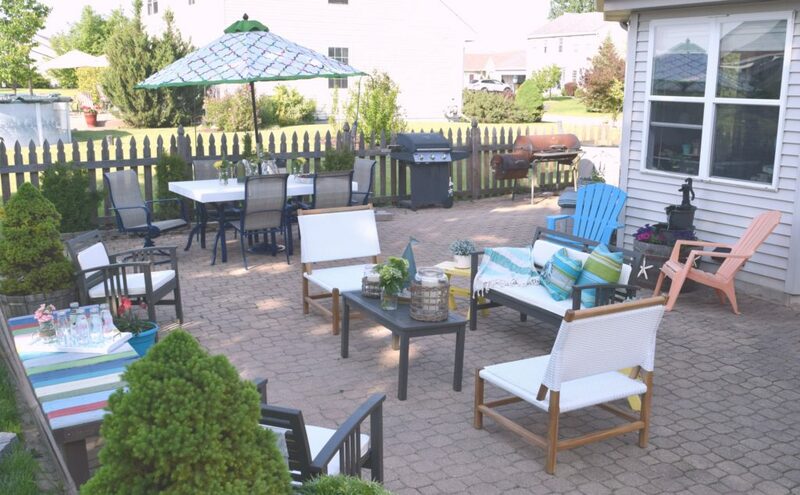 I love to BBQ and have people over and it would be non stop i I had a back yard like that! Aww, thank you so much! 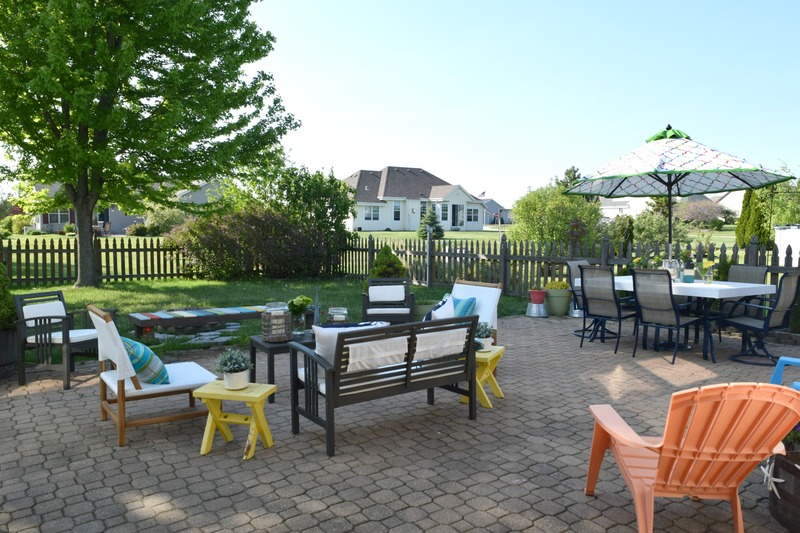 We really enjoy our backyard! WOWZA you not only did an amazing job but you hit a homerun here. I love that you laid this out step by step. I want this! 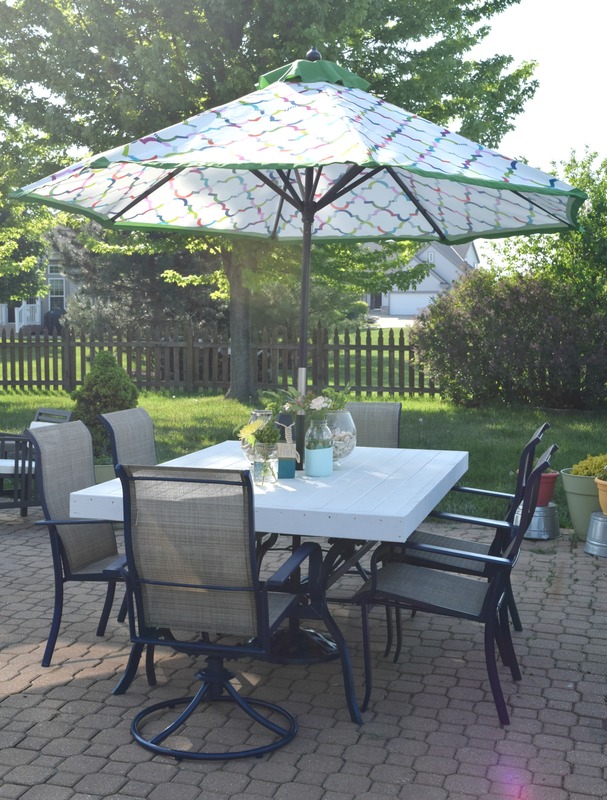 That is a great place to have a summer dining table. 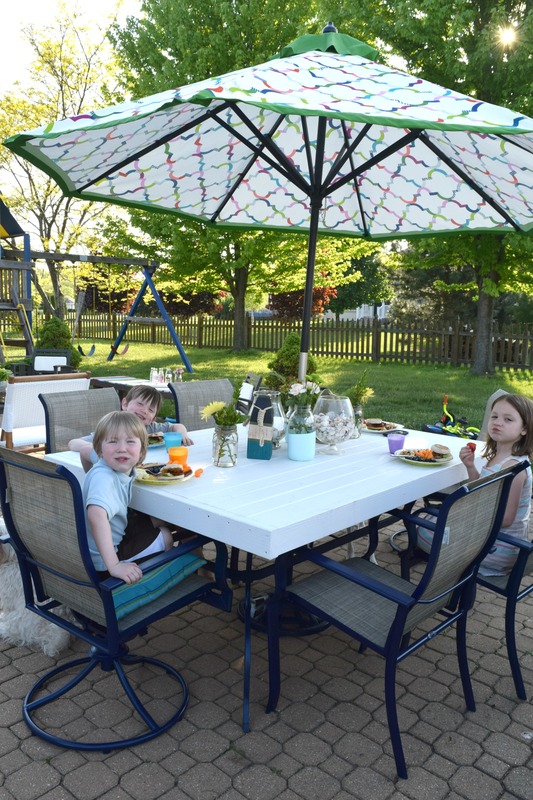 🙂 We like to eat outside too. I love it! The chairs came great as well as the table. I love reusing items and making them into something new. Enjoy! WOW! Another job well done!! 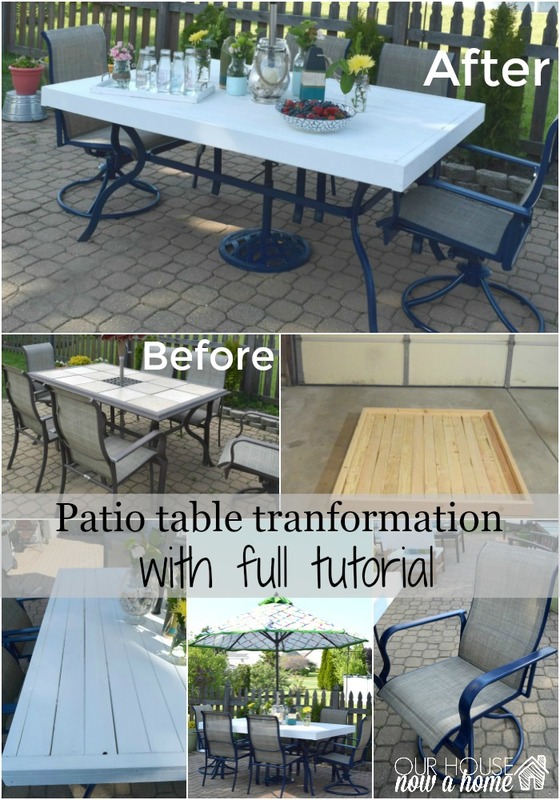 I love how you transformed your patio, and your new table looks AMAZING!! That was fun and wonderful for sure! I love the result and it’s really amazing. I want this backyard! The colors are SO California! Every makeover/project is so enjoyable to see and I love the step by step tutorials and pictures as it goes along. I love this! Just curious after a couple summers how it held up? This is a great question Melanie! 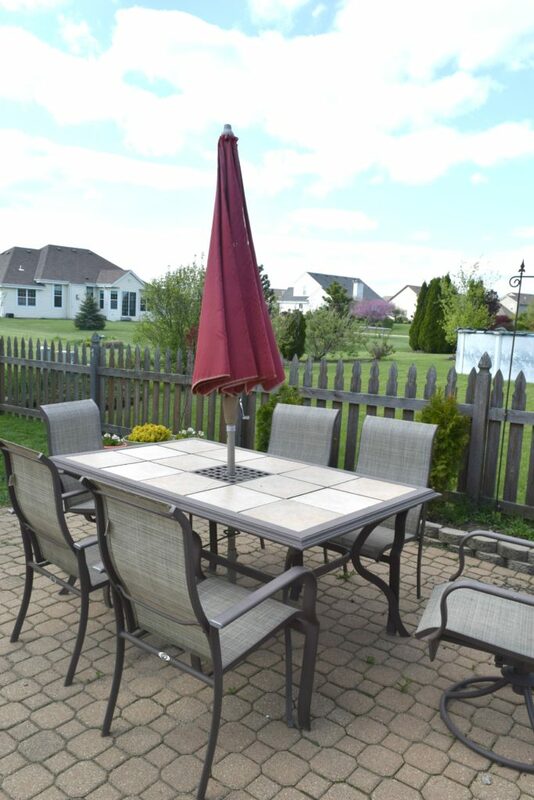 This patio table has held up really well, I plan to use it this Spring once the weather warms up. I have not had to alter it or repair it at all!